Paultons Park is commited to operating responsibly and fairly across everything we do. On this page you will find information about us and our operation including how we look after the environment and how we strive to give our guests the best and most enjoyable day out we can. Through the extensive investment in solar panels that are installed on the large roof spaces across the Park such as our workshops, stores and guest welcome building we are able to generate between 7% - 12% of our power requirements annually. The actual amount of electricity produced is purely dependent on the amount of sunshine and bright days we experience during a year! Where possible moving forward we will look to add to this system be it through new or original buildings. We also actively take steps to minimise our power requirements, for example all our lighting in buildings throughout the park is going through a staged upgrade to LED equipment. The LED fittings are much more efficient, and when installed with sensors instead of switches we remove the possibility of these being left on burning unnecessary power. Examples of this can be seen in our toilets and offices across the park. All equipment sourced across the park is always checked to make sure we are using the most energy efficient model of motors or hardware. This ranges from new rides and attractions to our vehicles on site (many of which are now run on electric motors). As a business we take steps to ensure we are responsible in our water usage to make sure all wastage is minimised as much as possible. In 2014 we made the switch to waterless urinals. This new system allowed us cut out unnecessary water usage which amounted to hundreds of thousands of flushes a year, without affecting our guest experience. The taps we use in our toilets across park are also designed to only deliver water for a set amount of time. Ruling out the possibility of these being left on and water being wasted. Regular checks are carried out on all this equipment to ensure it is functioning efficiently. The two most iconic buildings at Paultons Park are the grass roof building in Peppa Pig World and the Gateway Building at the entrance to the park. Both these buildings have been designed by architects who specialise in sustainable building techniques and the creation of energy efficient structures. The Peppa Pig World building has of course the grass roof which encourages wild life and creates a bio diverse eco system from an otherwise wasted space. The wildflower meadow on the roof of the building supports a wide variety of fauna and flora including our local Bee population. Both buildings boast high insulation properties from the construction techniques and materials used. This also includes underfloor heating in the Winter to provide a very efficient heat source, an array of pipes laid underneath the floor radiates heat throughout both buildings. In the Summer the wind catchers on the roofs of both buildings generate a natural form of air conditioning to keep the buildings cool and fresh. These work through a mixture of both solar and wind power, the solar panels in the units generate the power for them to draw the hot air out of the building by utilising the breeze or wind to do this. Cardboard – we have a bailing machine that bails all our cardboard into “mill” sized bails that go straight into the recycling stream with no secondary handling. By bailing the cardboard this minimises the transport required to remove it from site, and due to the volume generated avoids it going into our general waste stream. Plastics, Glass and Tin – Are segregated both in our kitchens and guests are asked to segregate this into separate bins around the Park. This is collected separately and is collected weekly by a licensed recycling company. Food Waste – Is segregated and is taken away again via a specialist company for composting. Wood and Garden Waste – Is segregated and mulched on-site in a special dedicated Eco Composting machine that was sourced specifically for this purpose in 2017. All of our composted waste is reused by the gardening team on our gardens around the park. Metal – We have a dedicated skip that metal is segregated into and is recycled from. General Waste – Anything that does not fall into the above goes into our general waste stream. On site we have two compactors that reduce the waste by a ratio of around 9:1 in volume terms to save transport and “road miles”. This then goes for incineration which in turn generates electricity directly into the National Grid. The incinerators at Marchwood and Portsmouth combined produce approximately 30 megawatts of electricity which is sufficient to supply 43,000 homes! No waste produced at Paultons goes to landfill and hasn’t for many years. We are constantly looking at ways of reducing our waste and we are always reviewing our activities to identify different ways we can improve on the current procedures and processes we have in place. Due to the nature of our business – we know that the vast proportion of the packaging we produce on site (in addition to that which guests bring onsite for picnics etc.) is both consumed and disposed here so we have control of how it is disposed of. Please rest assured that at Paultons we do have a hugely responsible attitude to the protection of our environment and outside the disposal of waste this extends to minimising our energy consumption, generation of our own power via an extensive investment in solar panels, having our own on-site composting facilities and continually looking at ways of minimising our usage of water. As a business Paultons Park takes its responsibilities to the environment very seriously and we continually work to reduce our impact on the environment in any way we can whilst still providing a high quality experience for a family visit. 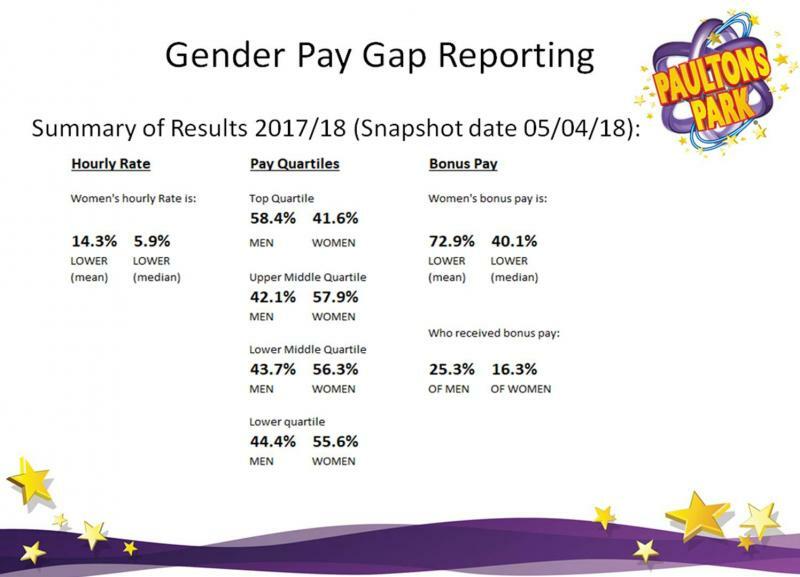 In accordance with government legislation and the UK Equality Act 2010 please see below our Gender Pay Gap Reports which are also published on the www.gov.uk website. This states the differences in average pay and bonuses of our male and female employees. I confirm that the published information is correct.